Wayne truly embodied this belief system. The happiness he exuded is available to all of us when we practice this principle daily. Step 4 of Judgment Detox is See for the First Time. By the time you reach this step you have established a prayer practice and begun to actively cultivate compassion. You’ll now be ready to shift how you see the people you’ve judged. We often judge other people — and ourselves — by projecting old experiences onto the present. When you practice seeing someone for the first time, you free them from those projections as well as the false beliefs that separate you. Instead of seeing another person through the lens of the past, you’ll see them as someone calling out for love. We begin to heal our judgment toward others when we accept that people are our teachers in the classroom that is our life. This lets us look at our situation differently. You’ll witness how you drag the past into the present, and then you’ll be able to choose again. In Step 4 you’ll learn how you can choose to look at a person as if you’re seeing them for the first time. Imagine how free you would feel if you didn’t lug your past into your present with every encounter! 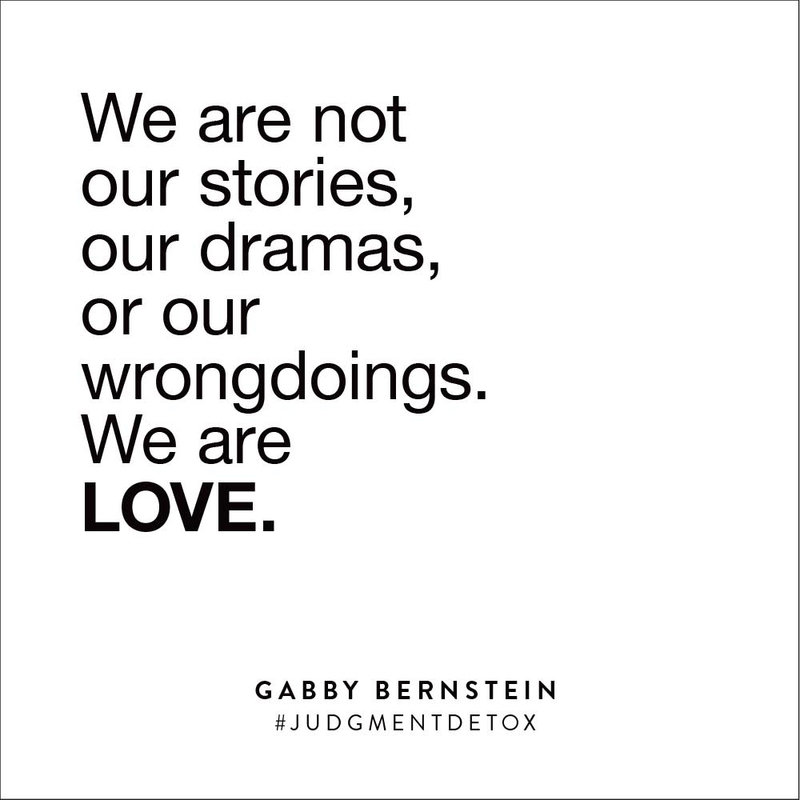 I want to share an exercise from Judgment Detox that is actually an old-school Gabby exercise from when I was coaching groups of women in my little NYC apartment! This practice is really fun because you can feel your energy and mood shift moment by moment. Saying this prayer instantly shifts your perspective. Every time you say it you begin to see the world differently. Bring this prayer to the relationships that hold the greatest separation for you. Who have you made special and better than you? Who do you perceive as inferior to you, or even bad and hateful? Whenever you notice yourself judging someone, say silently, “The light in you is all I see.” Use this prayer with people close to you and with total strangers. In fact, it can be really powerful to direct this prayer equally toward strangers as well as people you know. Back in the day I had my students go out into the streets of New York City silently repeating “The light in you is all I see” at each encounter. They used it on the subway, on the sidewalk, while waiting for lunch, at work and at home. They were always reminding themselves to only see the light in others. I asked them to do it for one full week and then share their experiences with the group. The results blew me away! Each person came back with her own miracle to share. When you go out of your way to see people in their light, you are returning to truth. When you see the world differently you can transform your life fast. You feel relief in letting people off the hook. The simple truth is that it just feels better to be accepting and compassionate. It feels empowering to see love wherever you are. Check out this clip where I touch on one of Yogi Bhajan’s 5 Sutras for the Aquarian Age, which is to recognize the other person is you. This is a big part of this step of Judgment Detox and the practice as a whole. As you can see from this lesson, the simple willingness to see others with compassion is very powerful. This exercise I’m sharing today of seeing others in the light can start a chain reaction and shift your perspective. When your only job is to see everyone in light, you have no time to focus on fault and judgment. We spend our days living in the judgment cycle, and the moment you get yourself out of it you clear space to receive a stream of well-being and joy. When you proactively see others in light, you allow the stream of well-being to flow. In the absence of your judgment, all that’s left is love. Leave a comment below letting me know what you experienced! Did other people begin acting differently toward you? Did you feel a change within yourself? I want to hear your miracles! Can’t wait to try this! I have noticed that I am now consciously noticing whenever I am judging people and I immediately stop. So I am happy to have this mantra. I have been a student of the course for awhile and following and working all of Gabby’s books for years. I have experienced monumental shifts at work. Completely healed a relationship and my perception of the most annoying colleague I had ever. Worked through the family drama too, which was so freeing. However, despite years of honestly trying hard and forgiveness practice I still cannot even stomach the idea of seeing the light in my ex husband and his mother. They constantly belittle, criticize, and demean me and do everything poassible take away my power (regarding my son). I feel so helpless and hurt constantly and even sometimes believe the hate they spew. Forgiving the past is one thing but when the venom occurs on a weekly or monthly basis, I really don’t know how to work these steps to be free of that. Any ideas would be super helpful. Practice the steps in order. Forgiveness is the final step, and I think it will resonate with you deeply. The slightest willingness is all you need in order to heal judgment and free yourself, and the fact that you are commenting on this blog shows that you do have willingness. You want to feel better. Forgiveness is a blessing for YOU. You can forgive your ex and his mother without keeping them in your life. You can work on healing judgment toward them while also speaking up firmly for yourself. I honor your feelings and honor your courage to share this. Practice the steps. Be open to possibilities. This detox is for you to feel free. Thank you Gabby! This is exactly what I needed right now. “The light in you is all I see.” My anxiety level feels less already. Thank you for being a beacon of light! Gentle and reassuring wisdom on the Light within us all. And a fond reminder to indeed “remain Light/(light)!” Best line from your blog post above: “When your only job is to see everyone in light, you have no time to focus on fault and judgment.” Clear, concise and empowering. All blessings! Thank you for being part of this movement!! My soul feels lighter already just picturing those around me and saying this! I’ll definitely give this a try. What if the person you’re dating is abusive and cheating? I’ve been compassionate so many times and forgiven behaviour that has been unacceptable due to the fact he’s had a terrible upbringing, suffers from mental illness and is doing his best despite many mistakes. But I feel it is more authentic to see the dark in him.. to get angry, to tell him how mad I am and judge his behaviour as unacceptable and to walk away. If someone is abusing you, the best thing you can do for your health and safety is to leave them as soon as possible. If you are being abused please contact the National Domestic Abuse Hotline at 1−800−799−7233. This is the most loving thing you can do for yourself — to take care of yourself. We can forgive others and heal our judgment toward them without keeping them in our life. You may be able to find forgiveness for this person who abuses you and cheats on you, but you absolutely DO NOT have to stick around in the relationship or keep them in your life in any way. Determining that this person’s behavior is unacceptable is a smart discernment, not a judgment in the negative sense (I explain the difference in the book). If you are at risk or simply want to speak with someone, please call the hotline. Sending you love and light and all my strength. So simple and yet so powerful. I’m going to start implementing today. I will try that with a difficult co-worker. I hope it works as I’m at my wits end trying to deal with her. She micromanages me and is very negative, and I’m way too sensitive. Practice the entire Judgment Detox with her in mind. Step 1 on its own may give you great relief. I expect that tapping on the judgment (and feeling judged) will also help a lot. SO beautiful and inspiring! Haven’t got there with the judgment detox yet.. I’ll try it out immediately! I know that I should not judge my mother, mostly I know that she is my mother because there is something to understand and she is the teacher for it. In so I try to see her positively. However, her ways of thinking and living impacts my well being values and self-esteem and it is hard to not be frustrated of being ‘stock’ with a living environment that is not mine. For exemple, I am vegan gluten free dairy free and passionate about health. Well, she buys junk foods. Whenever she critisize me about going to the gym instead of looking for jobs ( helps me with my anxiety ) or make noize for cooking a healthy meal then I tend to skip gym or oveat her foods. It’s soo hard. What can I do, I wish to move out but would need a job that pays enough. Love this one. It resonated so much with me I made a sign for my wall at work. Just what I needed to hear today. I’m finding that it’s easier and easier to see only the light in people, but not in my boyfriend. He speaks so negatively about everyone, we can go to the grocery store and in 5 minutes there I hear, “she’s too skinny; that cashier doesn’t have her stuff together; why is that old lady in our way, she’s taking to long.” So I feel like I see the light, yet I have this negative voice next to me constantly and then I can’t see him as light because he is darkening my space! Not quite in those words, but understanding that he will never accept me for who I am spiritually and that I can’t change to accommodate his desires to attend an Evagelical church that judges the lifestyle of others every Sunday; we are parting ways and we are doing it with respect for each other. Thank you for letting me see that it’s okay to let go. It hurts after 2.5 years, but I know the universe has my back! Thank you for this reminder, this is exactly what I needed to read today. I’ve been trying to get out of such a mind funk lately – How could I forget this daily essential!? I love you and all of your books! Can’t wait to read Judgement Detox! Just come back to love… divine guidance at work!! Simple and great thought for making life ease to live love life. Gabby may god bless you always all moments forever. I purchased the book Judgement Detox and am learning so much! It is on my nightstand along with A Course In Miracles. I have learned so much from reading your books Gabby! Thank you much! Beautiful!! I am so happy and honored that it is serving you! As I’m getting to know my inner voice better and better, it’s sometimes incredible to note how fast it is and judgemental. My ego likes to keep me safe by creating a distance with just about everyone, but that’s not the kind of safety I’m looking for. I’ve tried several methods to beat this, all based on meditation and calming my mind down. But then when the tension begins to rise (3-year old daughter likes to scream and object after a day at work when you just came home and all you need is some decent food and some quietness ; ), it’s as if all that hard work in getting ‘zen’ is for nothing. And now I’m a little amazed. Your guidance in this post is so efficient to beat this, it’s incredible. I’ve used it now for just one day, but the difference it makes is huge! I literally feel so much more warmth coming from the people around me, and just by repeating that little phrase in my head… I now like to repeat it every time I meet a person, because the warmth and compassion that’s there on the other side is really wonderful. It’s like a Namaste, in a language more close to me. Thanks for sharing Gabby, this really made a step change happen! Thank you so much for this honest and candid comment. You are witnessing your judgment without judgment like a pro. This exercise is one of my favorites because it works so quickly. It gets us right out of the zone of judgment. I am so glad this served you. Namaste. I love this practice and it’s amazing how fast it works! Magic. My question is – can I direct it towards myself? I don’t know why but my head is filled with so many negative thoughts about myself right now. About all and nothing. I know my thoughts are energy and create my reality and usually I’m quite kind to myself. But now, for some reason, I struggle to soften. “The light in me is all I see”? “The love in me is all I see”? Would that have the same effect or should it be phrased differently? ABSOLUTELY. Yes. Make it your mantra. Wow! I felt a bit judgemental towards my brother and I happen to release my judgement see my brother reaching out for love as he has issues of his own and I felt disappointment for sure but I saw him in the eyes of love said out loud to the universe I choose to see in the eyes of love and compassion. For several weeks I’ve been using this prayer in a way that I don’t think it was intended: Many times when I feel annoyed by my dog or she misbehaves I tell her out loud, “[Dog’s name], the light in you is all I see.” It holds a mirror to myself reminding me of my own light, and it reminds me that she’s just doing what dogs instinctively do and that I have to patiently correct her (or myself). Saying the prayer – sometimes multiple times – calms me down. My dog is a furry embodiment of light and love with no ego. I suppose that in this way, my dog is teaching me. Thank you for this step. This was the perfect read before I close my outer eyes to sleep… Beautiful – thank you! Tha k you Gabby….you are a beautiful light for this world! I am excited to practice this…..so needed for me right now. Namaste. Today is my Course in Miracles Lesson 111. As I’ve prayed and meditated on, “Miracles are seen in light, ” i felt like i was searching and seeking deeply, without an answer, while knowing answers come when we truly are ready and open to receiving. I read the article above again, and remembered that a miracle is the shift from fear to love. When I’m looking for and acknowledging the light in others and in situations, miracles happen. Thank you for reposting this just when i needed it. Another light moment! This is awesome and so are you Sarah! Keep shining your light! I am going through a lot right now. Had to walk away from someone I pictured spending my life with, it took a year of losing myself trying to help her, and I left finally, not because I wanted to, but because I needed to. Today my friend sent me a picture of one your the universe has your back deck of cards and maybe my mind isn’t clear enough to really understand it but it says “I let go of the shadow of the past by seeing someone for the first time with the eyes of love” what does it mean? When we look at someone through the lens of love, we can begin to forgive past situations as well as forgive ourselves. 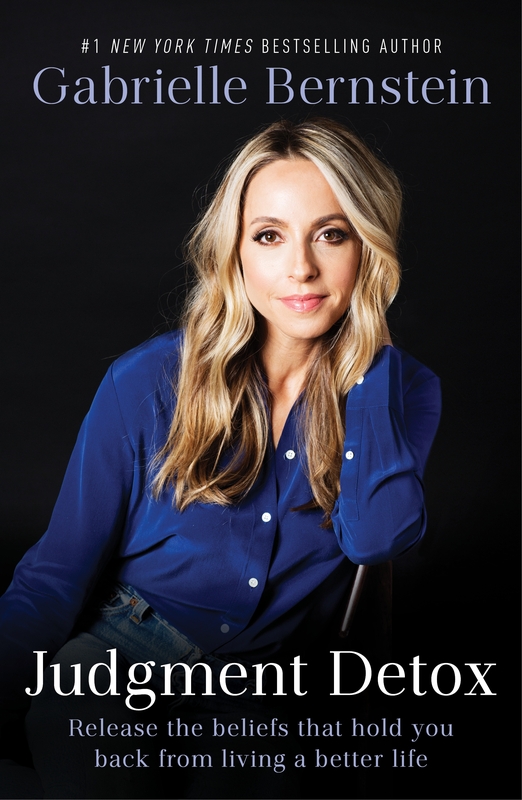 Please check out this blog post which will offer more support: https://gabbybernstein.com/say-one-sentence-see-world-differently/ Sending you lots of love and healing.